THE current UK contemporary jazz scene continues to reveal some exciting line-ups, bucking the recognised trio or quartet trends of piano, bass and drums plus soloist. As such, we see another excellent new Edition Records release from the Neon Quartet. 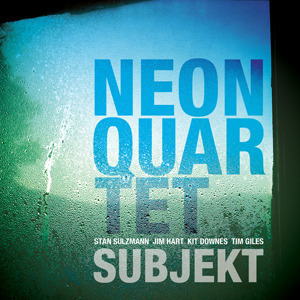 Subjekt follows on from Catch Me (2010), and also the earlier Neon trio release, consolidating the considerable talents of Stan Sulzmann (saxes), Kit Downes (piano/organ), Jim Hart (vibes) and Tim Giles (drums). Now in his 60s, the much-respected Stan Sulzmann has an impeccable jazz pedigree, playing with the likes of Kenny Wheeler, Gil Evans, John Taylor, leading his own big band (the list goes on… and on!) – and now teaming up with a younger generation of intelligent and creative jazz stars to create Neon. Kit Downes shines on this album, immediately stamping his mark with distinctive piano and electronics on the sparkling opener, Maison Musique which, along with Hart’s resonant vibes and Giles’ percussive searching, provides a twisty, edgy platform for Stan Sulzmann to launch from (seeing Downes perform live, with the innovative Troyka, I swear he juggles multi-keyboards with two pairs of hands!). And he skilfully banishes the notion that a bassist is requisite, his earthy bottom-end sounds providing an all-round balance to the quartet. Mother Hen is similarly restless, whilst Buster’s New Tail travels to calmer territory, as does New Balls, showcasing Jim Hart’s brilliant, seemingly effortless dexterity. Tim Giles’ technique is fascinating throughout, with his emphasis on cymbal work, ticking along with impressive precision. Springs and Neaps is a highlight, building gradually from a gentle melding of vibes and organ, with Sulzmann opting for soprano and sounding great. Monk’s Bye Ya opens with gloriously spiky and entertaining piano, Giles lapping up the mood before that assured and uplifting tenor reins the guys in (well, a little! ).Ruskin’s Retreat (the second of Sulzmann’s compositional contributions here) concludes a pleasing set from a group of instrumentalists and writers who clearly understand each other well. This is a ‘grower’ of an album (aren’t they the best?) which gradually reveals its delightful details and nuances, drawing us into a rich, fluent and upbeat soundworld. As they tour through November, the live improvisational breakouts from Subjekt will be something to relish.